Comedy with a cherry on top. Joyful and surprising, even when you're cracking open an anthropomorphised egg. What is it? An adventure game about an irritable blob who likes fruit. 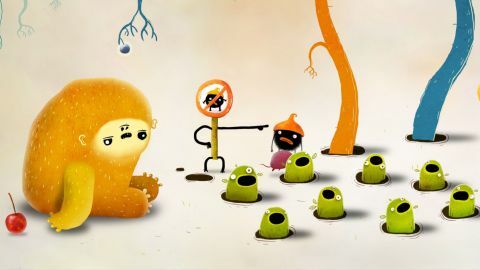 Chuchel is a comedy point-'n-click adventure game from Amanita Design, the creators of Machinarium and Botanicula. Your job is to guide a sort of hairy ball of uncontrolled emotion—the titular Chuchel—on a quest to retrieve a cherry. Throughout, you'll encounter obstacles in the form of creatures and contraptions and silly situations. Along the way, you'll be foiled frequently by Chuchel's nemesis, Kekel. I'm being prosaic, but it's useful to have a grounding in Chuchel's handful of definable core elements. Chuchel is an adventure game, but its interactions aren't grounded by logic, and its puzzles aren't really the point. Chuchel has a story, but it's deliberately playful and surreal. Botanicula is its closest counterpart in systems and style, but where that had an ecosystem backing up its absurdism, Chuchel is a series of vignettes linked by tone, aesthetic, and an insatiable desire for a fleshy drupe. On the first screen, you find Chuchel asleep in a cardboard box, surrounded by objects and animals. You don't so much control Chuchel as influence the environment by clicking on the things around the room. Click on a bird, and it toots merrily—until Chuchel throws a slipper at it. Click on the elephant, and it trumpets musically—until Chuchel throws an alarm clock into its trunk. Each item or creature elicits a response. The joy of playing Chuchel is in their discovery. The upshot is that progression isn't a goal in and of itself, and so the puzzles aren't challenging as much as they're an excuse for funny little moments. It's a good way to reframe the traditional point-'n-click structure. Plenty of adventure games contain questionable logic, but often that's a failing. In Chuchel, it's the point. The solution to the first puzzle is to click on a bottle of water twice, causing it to pour out of the head of a greenish, er, thing, into the mouth of a bird who loses balance and falls into Chuchel's mouth. At which point a Gilliam-esque hand descends from the screen, picks up Chuchel and the cherry, and tosses them into the next area. Plenty of adventure games contain questionable logic, but often that's a failing. In Chuchel, it's the point. Some areas are 'solved' by simply clicking on the only thing on the screen that you can interact with. Some involve short, surprising minigames. Others are more elaborate and complex, requiring you to click on the right things in a specific order. It rarely feels like a chore—every interaction is an often funny celebration of animation and music. It uses its lead character's selfish impulsiveness to great effect, crafting funny situations that feel weird and anarchic and warm hearted. And if you really can't work out a route to the next screen, you can click the button at the top-left of the screen to be shown the solution. Chuchel isn't looking to frustrate. As in Botanicula, the whole thing is enlivened by the sound design—specifically the quirky, inventive music of Czech band DVA. Chuchel is sparse in its presentation—some screens feature just an assortment of creatures (and a cherry) against a plain, light pastel background. But the music and expressiveness of the characters imbue the action with a richness that elevates the minimalist art. On balance, I think I slightly prefer Botanicula—its thematic cohesion and more overt musical playfulness resonated with me more. But that takes little away from the many things Chuchel does well. While I rarely found it laugh-out-loud funny, there's a joyfulness to its scenarios that I couldn't help but smile at. And, while it can often feel arbitrarily surreal, it grounds itself well with a central relationship between Chuchel and rodent-ish nemesis Kekel that's heartwarming to watch unfold.